NEW ORLEANS – For the second time this season and ninth time in the past five years, 17 men were under consideration to be named to a single iteration of The Bowerman Watch List. 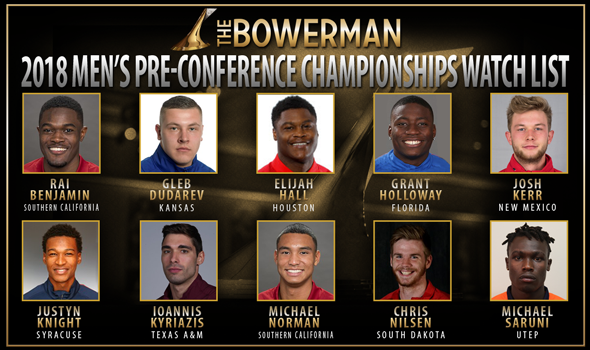 Seventeen men were on the minds of The Bowerman Watch List Committee four times in 2014 and three times in 2017 and both of those years featured heated competitions for collegiate track & field’s highest honor. This year proves to be no different as the 10 men who earned their spot on the Pre-Conference Championships Watch List all have a claim to be among collegiate track & field’s elite. Also Receiving Votes: KeAndre Bates (Florida), Akeem Bloomfield (Auburn), Denzel Comenentia (Georgia), Tim Duckworth (Kentucky), Devin King (Southeastern Louisiana), Kahmari Montgomery (Houston), Kenny Selmon (North Carolina). Based on what transpired since the last Watch List came out on April 19, New Mexico’s Josh Kerr and UTEP’s Michael Saruni stole the headlines in record-breaking fashion. Less than two weeks ago at the Mt. SAC Relays, Kerr shattered Sydney Maree’s near 37-year-old collegiate record in the 1500. Kerr clocked a time of 3:35.01, which lowered the standard by 0.29 seconds. The previous year Kerr came agonizingly close to Maree’s mark (3:35.99 to 3:35.30), so this year he left nothing to chance. Saruni showed he was the all-time best in the 800 this past weekend, less than two years after Donavan Brazier did the unthinkable and supplanted Jim Ryun. The sophomore from Ravine, Kenya, turned two laps in 1:43.25; 0.30 seconds faster than Brazier did at NCAAs in 2016. South Dakota’s Chris Nilsen also did something no collegian had done before. Nilsen cleared 5.77m (18-11½) this past weekend at the Drake Relays, which is the highest vault by a collegian in the 109-year history of the meet. The sophomore from Kansas City, Missouri, placed second in the elite competition behind 2016 Olympic bronze medalist Sam Kendricks. Syracuse’s Justyn Knight notched an all-time top-10 mark in the 1500, in the same race where Kerr stamped his name into the record book. Knight finished runner-up to Kerr in 3:36.07, the eighth fastest time in collegiate history. Kansas’ Gleb Dudarev came within two feet of cracking the all-time top-10 of the hammer, one of the most exclusive charts. Dudarev hurled the chained implement 78.04m (256-0) and is now the fifth best performer in collegiate history with the 12th best performance. There are only three men with marks in the all-time top-10, including eight from record-holder Balazs Kiss alone. The Southern California duo of Rai Benjamin and Michael Norman appear on the same Watch List for the second time this season. Norman raced to the top of the Descending Order List in the 400 a few weeks ago when he clocked a time of 44.53 at the Mt. SAC Relays, which also made him the 14th best performer in collegiate history. Benjamin is third nationally in the 400 and fourth nationally in the 400 hurdles at 44.74 and 49.84, respectively. Houston’s Elijah Hall and Florida’s Grant Holloway are both in a holding spot ahead of their respective conference championships. Hall last competed at the Mt. SAC Relays, where he was a member of the Cougars’ 4×100 and 4×400 relay teams. Holloway laced up his spikes three times at the National Relay Championships for the 4×100, 4×400 and long jump and it was his anchor leg of 44.54 in the 4×400 that sent the Gators to victory. Texas A&M’s John Kyriazis, the final man on the Watch List, has still yet to compete this season and will need to hit a qualifying mark at the SEC Championships in 10 days to have a chance at defending his NCAA crown in the javelin. Here are those seven men who ended up in the “Also Receiving Votes” category: Florida’s KeAndre Bates, Auburn’s Akeem Bloomfield, Georgia’s Denzel Comenentia, Kentucky’s Tim Duckworth, Southeastern Louisiana’s Devin King, Houston’s Kahmari Montgomery and North Carolina’s Kenny Selmon. Bates, Bloomfield, Comenentia and King all appeared on the Watch List at some point this season. The next Watch List will be released on May 17.